Ever thought you’d be intimidated by a matching spandex get-up? Me neither. But today, matching workout wear and new sneakers are starting to feel more important than the actual workouts you do at the gym. Walking into the gym can be daunting. Even at a big school like the University of Massachusetts, you still manage to see what seems like everyone you know, and especially those people you don’t really want to see as sweat rains from your entire body. Unfortunately, that really cute guy you’ve been seeing in class all semester always finds the treadmill right next to you when you are at your peak huffing and puffing. You’re not alone. Feeling anxious and making excuses to get out of going to the gym is human nature. It’s the strength to push yourself through that fear that helps you succeed your goals. So, let’s start small: What the heck do I wear to keep up with all these name brand outfits that seem to line the inside of the gym in different color variations? The answer is that the expensive clothes are not what make you confident, it’s how you hold yourself in whatever you’re wearing. This might be advice your mom gave you in the seventh grade — when all you wanted was that Abercrombie top, but she brought you to Old Navy instead — but she was right. The first step to being more confident at the gym is determining what you feel the best in — whether that means showing some skin to show off your progress, or wearing that old T-shirt that has holes in the armpits because you can’t seem to take it off. The next hurdle to jump is finding what your goals are for going to the gym. Is it to lose some extra weight from the Antonio’s and PBR last night? To gain more muscle? To be a better runner? To just start living a healthier lifestyle? Everyone’s goals are different and recognizing that is passing your first checkpoint. Feeling self-conscious about your appearance at the gym is natural; there is always going to be that girl with the super tight, Rhianna-like body and that guy who looks like he lives with an IV pumping protein shake through his body 24/7. But you need to be realistic and know that you don’t have to look like that to feel confident. The last push is finding out what workouts work for you. A way to figure this out can be Group Fitness classes, which the UMass Recreation Center has 51 of! From Acrobatic yoga to Broga to Spin and Core, with some instruction and a scheduled workout plan, these classes can help you battle the intimidation of the gym in a small, comfortable group. 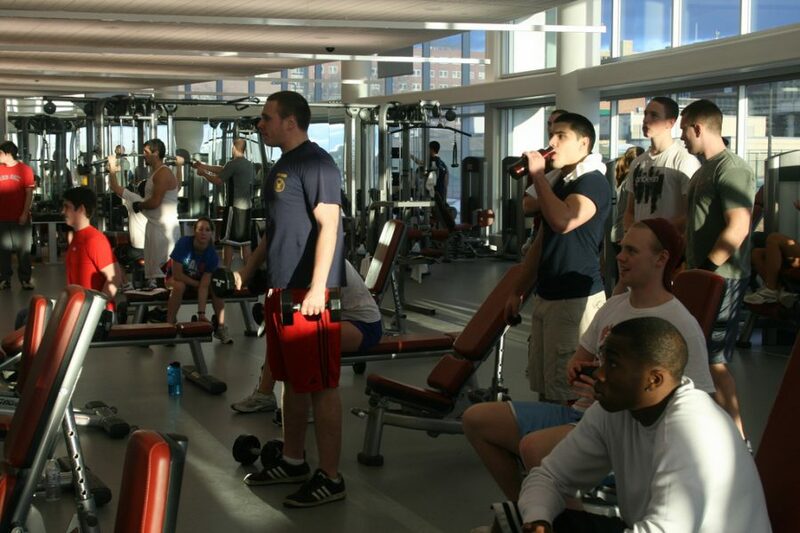 But if Group Fit isn’t for you, there are so many machines to use and different activities to do at the Rec. Slowly, you can build a schedule of allotted time to spend at the gym each week. Start small and work up to your goal! If it’s the first time you’re visiting the Rec, just take 20 minutes to sign in, see the locker rooms, take a walk around upstairs and scope out what all the hype is about. Most likely, you’ll see that it’s not as scary as it’s cracked up to be. The time of day will really impact your experience at the Rec as well. Morning, early afternoon and later in the evening tend to be very quiet, but once 6 p.m. rolls around, it’ll be slammed with crowds. So, whether you are an early bird, a night owl or want to be in with all the action, there’s a perfect time for you. Here starts the time where you stomp on those fears and start working toward your goal. Focus on your progress and work off all of your fears.